Victoria beat Western Australia by eight points in this game at the 1937 national carnival in Perth. 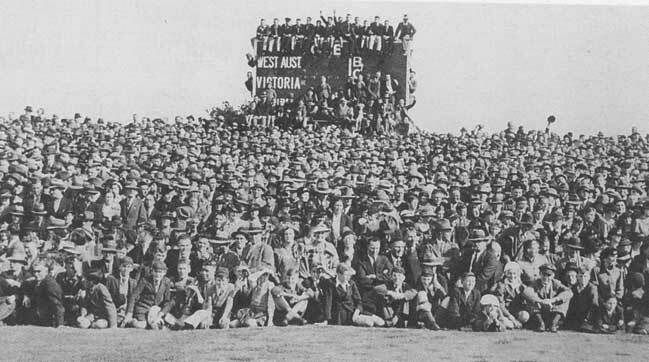 WA fans started getting a bit fractious about interstate games in the late 1960s and early 1970s when we found our boys lining up against the likes of Polly Farmer, Dennis Marshall, Ron Alexander, Barry Cable, Ross Glendinning, Ken Hunter, and Graham Moss wearing the big V of Victoria. They weren’t Victorians. Subiaco Football Club marketing man Leon Larkin came up with the idea of State of Origin football and in 1977 a WA team including VFL-based players thrashed Victoria at Subiaco Oval. Many classic games followed, some played on Tuesday afternoons. The West Coast Eagles arrived in 1987 and when Mick Malthouse took over in 1990 he was less than enthusiastic about many of his players taking part in State of Origin games mid-season. It wasn’t long before interstate games at the highest level became a thing of the past.